Click here for info and background on this weekly phenomenon! We had some great submissions last week – lets double the submissions this time! Tell your friends! 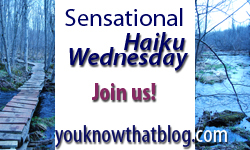 Even though I am away, I can still attempt Silly Haiku Wednesday! I will add it to my Wednesday post on Veto’s computer! .-= Sasha´s last blog ..faux key lime cheesecake =-.